Leading experts discussed the latest thinking in the field of performance management at an international conference in Cambridge this week that attracted 170 delegates from 40 countries. 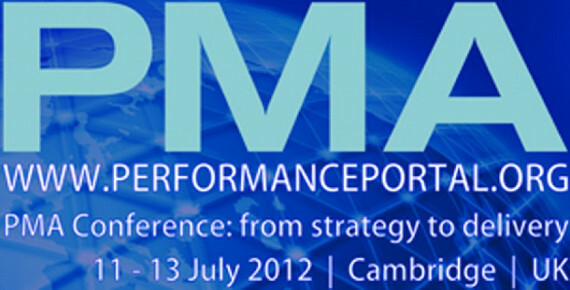 The PMA 2012 Conference took place at Fitzwilliam College between 11-13 July, and included presenters from academia, industry and the public sector. It was the 7th PMA Conference to be held and was organised by the IfM Education and Consultancy Services Ltd on behalf of the Performance Management Association. The theme for PMA 2012 was Performance Management: From Strategy to Delivery. The conference unveiled the latest thinking and research into how to connect strategy to delivery, through technology, systems and process. The three-day conference was a mixture of keynote and plenary presentations and discussion groups, plus a wide range of parallel sessions ranging from enterprise performance, manufacturing performance, intellectual capital, strategy and performance to name but a few. Three world-class keynote speakers presented at the conference; Howard Dresner, a widely regarded expert in business intelligence, Professor Gerhard Satzger, IBM’s Director Business Performance Services, Europe, and Professor Christopher Hood from the University of Oxford. The aim of the PMA conference is to bring together those who want to explore and better understand the role that performance measurement and management plays in improving organisational performance. No other conference better facilitates dialogue in the field of performance measurement, providing such a rare opportunity for academics and practitioners to meet and exchange ideas. Professor Andy Neely of the University of Cambridge Institute for Manufacturing, and Chair of the conference said, “Once again the PMA conference has demonstrated its reputation as the world’s leading industry-academic conference for performance management specialists”. The conference was co-chaired by Professor Mike Bourne from Cranfield School of Management, UK. PMA 2012 has continued to build on the success of previous international conferences, the most recent of which was hosted at the University of Otago, New Zealand in 2009. Further information, including the programme, may be found here.